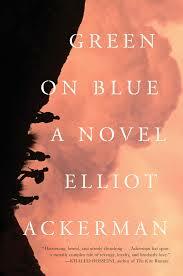 USMC veteran Elliot Ackerman’s novel Green on Blue describes events that ring true to my own deployment experience in east Afghanistan. As an advisor who daily spent hours in the company of Afghans with loaded weapons, a “green on blue” incident—the murder of an American by an Afghan army member–was always a possibility. Ackerman’s descriptions of torturous truck journeys down narrow wadis and on the edge of cliffs brought back memories, too. As I’ve written elsewhere, for every story of combat in Afghanistan, I have five involving crazy vehicle escapades. The portraits of village shuras and life behind kalat walls in Green on Blue mirrored dozens of my own engagements with Afghans, often with me being the only American in a room full of turbaned and bearded Pashtun men. For all that, as I began to read Green and Blue I was prepared to be disappointed, for I knew it might be hard not to quibble with Ackerman’s rendering of combat on Afghanistan’s eastern border with Pakistan. Happily, though, Ackerman gets all the above right and whole lot more, too. Through the audacity of its imaginative reach, as well as the acuity of its insight into what war in Afghanistan is about, Green on Blue significantly expands the borders of contemporary war literature. The story’s protagonist is Aziz, a young Paktika province Pashtun who signs on as a member of a militia to revenge the death of his parents and the loss of a leg by a beloved older brother. The militia he joins is led by a ruthless, mysterious, and charismatic leader named Commander Sabir. Sabir, aided and funded by an American advisor named “Mr. Jack,” battle with a clan led by a wizened tribal warrior named Gazan for control of a middle-of-nowhere village called Gomal. Gomal has no tactical, political, or economic significance, but Aziz, Sabir, Gazan, and other Afghans in the story fight over it in an endless cycle of violence rooted in personal vendettas and dreams of war profiteering. As the novel unfolds, Ackerman drives home the point that war in Afghanistan, as it is experienced by actual Afghans, is only circumstantially concerned with the American intervention. Even the green on blue murder that gives the book its title is more a matter of circumstance than an act motivated by hatred and global politics. All are caught up in this, he said. The question is whether you’ll be a victim or prosper in it. What justice is there for you if Gazan, who crippled your brother, prospers in peace with the Americans? What justice is there if we lose control of him and never build our outpost [in Gomal]? Yes, there will be peace for Gomal and Gazan, but us, what of us? The Americans will no longer need us. How do we survive then? We rushed past Shkin village, where cooking fires glowed inside the few mud-walled homes. We drove on towards the darkness of the southern mountains. At the base of the range, our convoy slowed to a crawl. Here the north road continued south, but we turned off and traversed the uneven ground to a wet ravine tha rolled out like a sloppy tongue. I watched Commander Sabir’s HiLux ease itself into the ravine’s mouth. It took the first bend and was swallowed by the mountain. Issaq’s HiLux followed and then, quickly, the rest of us. And our convoy disappeared. The mountains closed around us. We drove through them like children playing in a window’s long curtains, chasing each other, all of us near, hidden in the fold…. But Green on Blue‘s most interesting feature is its first-person narration in Aziz’s voice. War novels such as Joydeep Roy-Bhattacharya’s The Watch and Michael Pitre’s Fives-and-Twenty-Fives admirably feature Afghan and Iraqi characters, but Ackerman’s feat surpasses those with its plausible and engaging rendering of a life experience as foreign as an American might imagine. Such acts of ventriloquism are not without risk; an easy criticism would be that rather than a feat of empathetic representation, it bespeaks an act of literary imperialism bankrupt in principle and doomed to fail practically. Ackerman could well have told the story from Mr. Jack’s point-of-view or presented the story as memoir, for surely many of its events are close to those he experienced or heard about on deployment. But we have already have portraits of American army captains in Afghanistan in The Watch and Aaron Gwyn’s Wynne’s War, so kudos to Ackerman for approaching his story from a different direction. Green on Blue sympathetically makes us privy to Aziz’s dawning awareness of just how complicated and bleak is the world he inhabits. Once, in Sperkai, an older child had split my lip in a fight. When my father saw this, he took me to the boy’s home. Standing at their front gate, he demanded that the father take a lash to his son. The man refuse and father didn’t ask twice. He struct the man in the fact, splitting his lip just as his son had split mine. Before the man could get back to his feet my father left, the matter settled. On the walk home, my father spoke to me of badal, revenge. He told me that a man, a Pashtun man, had an obligation to take badal when his nang, his honor, was challenged. In Orgun, every stranger’s glance made me ache for a time when my father might return and take badal against those who’d pitied his sons. Its heft sunk into my palm, and I felt the permanence of its metal. A pistol’s purpose was the same as a rifle’s, but achieved it so casually. A rifle requires the whole body to fire it. Laying the buttstock into the shoulder, leaning against the recoil, concentrating on the sights, all of this draws from every part of the shooter. But with a pistol, just a flick of the wrist and a light twitch with an index finger delivers a hard bullet. Overall, though, Aziz’s voice is fine. Ackerman lets the events of the story pull the narrative forward by having Aziz relate them without much stylistic overlay. His thoughts and actions seem motivated by what anyone would conceive of as plausible human nature, leavened by pashtunwali. When I arrived in Afghanistan, an American told me that working with Afghans was much like working with Americans, except that Afghans possessed two great fears that Americans didn’t worry as much about: one, they might die at any moment, and two, their families would be left destitute as a result. The statement served me well as I watched the Afghans I knew make choices and express their beliefs. Now, reading Green on Blue, the claims seems true also for Aziz, whose ability to choose is constrained everywhere by the proximity of death and poverty, and animated only by dreams of nang and badal. His war, like my war, was not just flying bullets and exploding mines, but complex local social dynamics characterized by grudge, worry, feud, and angling for advantage. 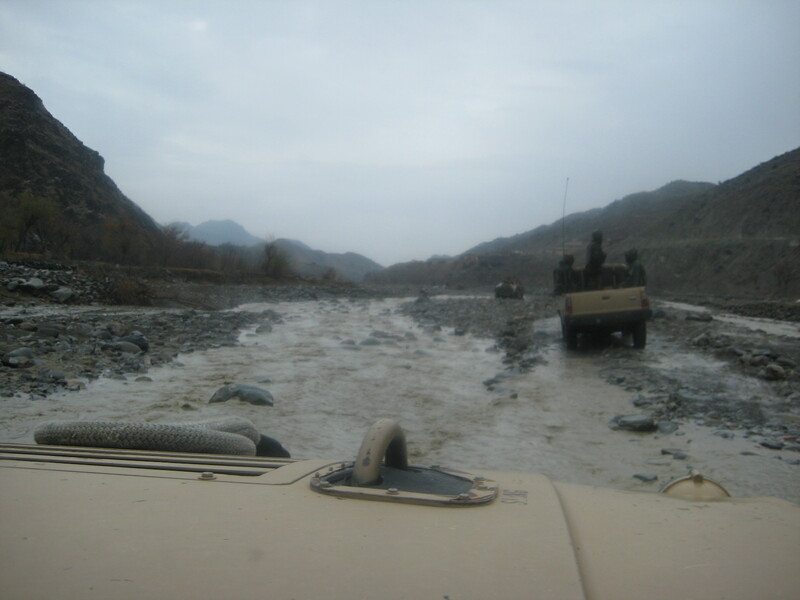 On the wadi road to Spera, Khost province, Afghanistan, January 2009. Elliot Ackerman, Green on Blue. Scribner, 2015. This entry was posted on March 10, 2015 at 10:33 pm and is filed under Art and War. You can subscribe via RSS 2.0 feed to this post's comments.